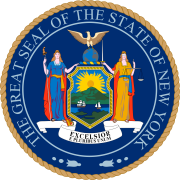 The 1846 New York state election was held on November 3, 1846, to elect the Governor, the Lieutenant Governor and two Canal Commissioners, as well as all members of the New York State Assembly and eight members of the New York State Senate. At the Whig state convention, Young was nominated for Governor on the third ballot with 76 votes against 45 for Millard Fillmore who had been the unsuccessful Whig candidate at the previous gubernatorial election in 1844. The Democratic and the Whig parties being of almost equal strength at the time, the cross-endorsed Anti-Rent ticket was elected. The incumbent Governor Wright was defeated. The incumbent Lt. Gov. Gardiner was re-elected. At the same time, the voters adopted the New York State Constitution of 1846, so that the elected Canal Commissioners could not take office for their elected term. Both Hudson and Clowes eventually took office by appointment to fill vacancies. Five Whigs and three Democrats were elected for the session of 1847 to the New York State Senate. Under the Constitution of 1821, every year 8 of the 32 senators were elected to a four-year term. These 8 now elected, and the 24 remaining state senators, were legislated out of office by the Constitution of 1846, their term ending on December 31, 1847. 72 Whigs and 56 Democrats were elected to the New York State Assembly of the 70th New York State Legislature, of whom 6 Whigs and 4 Democrats were elected with Anti-Rent endorsement. Obs. : The number of votes is the total of Whig and Anti-Rent votes for Young and Clowes, the total of Democratic and Anti-Rent votes for Gardiner and Hudson, and the total of Liberty and National Reform votes for Bradley and Chaplin.